The Common Barn Owl (Tyto alba) is said to be one of the most widely distributed birds in the world. I photographed this one at the raptor free flight display at the Arizona-Sonora Desert Museum, near Tucson, Arizona. When I took this photo (and several others) the owl was perched on its handler's gloved hand. As you can see, I was able to get quite close to it. Here is another portrait of a Barn Owl, and a photo of a Barn Owl in flight. How lucky you were to get so close. Beautiful crisp detail on this gorgeous bird. Wow, what a beautiful photo, you can see each individual feather. I love barn owls I think they are stunning birds. @ Becky and Gary - Yes, its always a privilege to be able to see such a creature up close. @ Celeste - Thank you. I agree that these are magnificent birds. They may be 'common' but they are uncommonly beautiful. 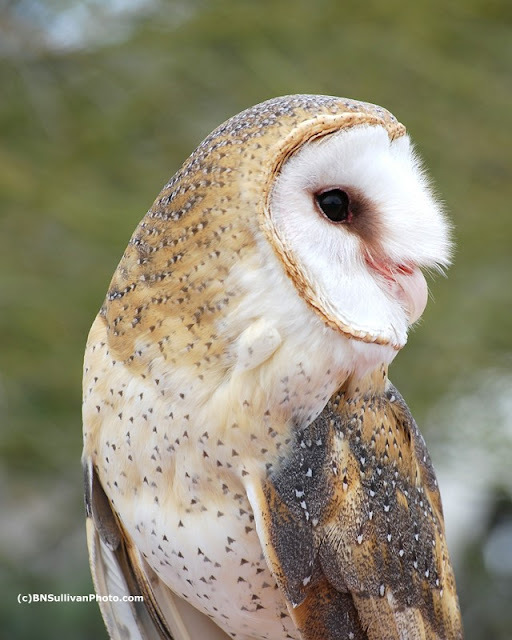 I just sdopted a barn owl to help a local breeding program as there aren't barn owls in New York due to pesticides and loss of habitat. Beautiful birds..
@ T and S - Thank you. @ Rambling Woods - Good for you! I hope the breeding program you are supporting is successful. Barn Owls are not only beautiful, they have a useful role in the ecosystem.